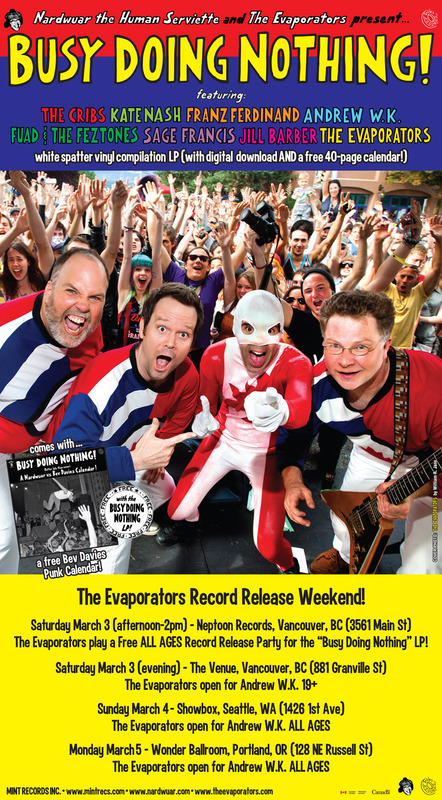 Nardwuar The Human Serviette News: The Evaporators Record Release Weekend + LP Pre-sale! 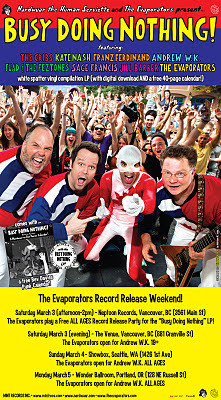 The Evaporators Record Release Weekend + LP Pre-sale! The Evaporators "Busy Doing Nothing" Record Release Weekend! Saturday March 3 (afternoon-2pm) - Neptoon Records, Vancouver BC (3561 Main St) The Evaporators play a Free ALL AGES Record Release Party for the "Busy Doing Nothing" LP! "The Busy Doing Nothing" LP/Calendar is Out March 6 (Mint Records) *BUT* a Pre-Sale is Happening Now! Enter "dootdoolaa" at check out for $2 off !